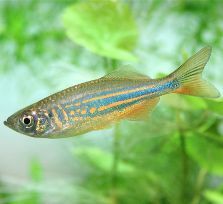 This large Danio comes from clear streams and rivers in Sri Lanka, Nepal, and the west coast of India. They live in moving water with rocky gravel bottoms. These strong fish love a good amount of current. You will need to provide them with a fair amount of swimming room in the middle of your aquarium. They are very active horizontal swimmers. You will also need to make sure you have a tight fitting hood on your aquarium because these fish are strong jumpers. This Danio does best when kept in groups of three to five fish. They are reasonably aggressive fin nippers and should not be kept with fish that have long fins. These are not great community tank neighbors because they are large and will bully smaller fish. Larger Cichlids are not able to catch this very fast swimming fish, but they will try. This makes Giant Danios excellent dither fish for shy Cichlids. Females have a full belly appearance. Males look, and move, like torpedos. These guys are a school fish and love to shoal with their friends. They can be rather skittish at times, so walking up to your aquarium fast may send them darting for cover. Be careful to keep your hood closed because one of your quick little buddies might jump out of the water. They can easily clear the side of your aquarium. When females are ready to spawn, they will become fatter. Move a group of several females and a couple males to a breeding tank that has been filled 1/4 way from the bottom. Adding marbles to this tank for substrate allows the eggs to fall into spaces that the adults cannot reach. Giant Danio are egg scattering fish. The females will lay around 300 eggs after spawning in clusters of plants. Watch for the fish to chase each other around and spawn. Once the eggs are scattered around the bottom they fall into the marble substrate. After a couple hours, remove the adults from your breeding tank. The eggs will hatch in about 36 hours. The fry will be swimming freely in another 36 hours. They should be fed crushed flake and Inforusia. For more information, go to Wikipedia's Giant Danio page.